Canadian heat pump manufacturer Nirvana has appointed Total Water Products Ltd as its new UK distributor. Nirvana heat pumps are made in Canada and are designed to withstand harsh Canadian winters and give excellent performance at the lower temperatures typical in a British summer. Michel Lesage, President of Nirvana Heat Pumps said: "I was impressed by the management team at Total Water Products and I am confident that they will be able to back our high quality product up with high quality support." 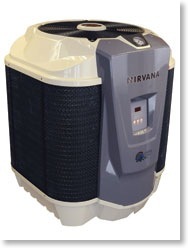 Nirvana will showcase their heat pumps at SPATEX. Paul Grunhut, Sales Director of Total Water Products Ltd said: "We are very pleased to have been appointed the UK distributor for Nirvana. When I saw the build quality and performance figures of the Nirvana range of heat pumps I knew they would be perfect for the UK market. 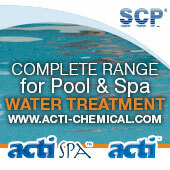 I am confident that when the pool trade see this heat pump at Spatex we will have a lot of interest." Total Water Products Ltd is based in South Wales. 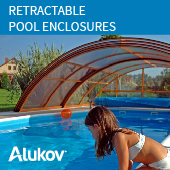 They are also the UK and EU manufacturer and distributor for the Lo-Chlor range of speciality pool and spa chemicals. Four models will be available in the UK with outputs from 21kW up to 34kW on single phase. Nirvana Heat Pumps are based in Quebec, Canada and have been growing sales of their heat pumps since the new management took over the company five years ago.